Peregrine Farm News Vol. 10 #38, 12/18/13 Winter Solstice edition. Last newsletter of the year and as I have been working on the end of the year bookkeeping we are reminded of just how challenging a season it has been. No disasters this year just too much wet weather for optimal growing conditions. The old saying “A dry year will scare you to death; a wet year will starve you to death” rings true and we have always preferred the drier seasons even though we do sometimes worry about if we have enough water for irrigation. The good thing for farmers is that there is always next year. 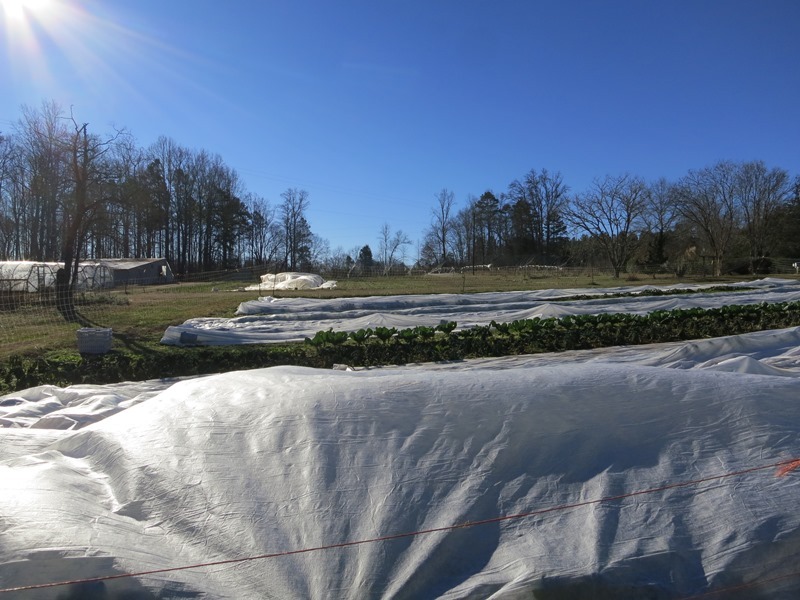 Preparations for 2014 are already underway with seedlings in the greenhouse, bulbs in the field and the seed catalogs rolling in. The first tweaking’s of the planting schedule and crop mix has begun, most of it will be finalized in the coming weeks. The most important piece of a successful year to come is already in place, great staff. Jennie of course is here year round and doing a good job of keeping us straight, Liz will also be back for one more season albeit for fewer hours as her farm and life begin to require more of her attention. It gives us great confidence and joy to know that they will be here. We may be a bit irregular over the coming weeks both in newsletter and market attendance as we are headed into the meeting season and will be gone a fair amount. Our plan is to be at market every Saturday in January and most of them in February but you will see different faces each week at our space as the three of us rotate through. As the year ends and winter officially begins on Saturday (sure feels like it started weeks ago) it gives us great comfort in knowing that we have such wonderful support from all of you, it gives us a reason to go out every day and make things grow. If we don’t get to say it on Saturday, thank you and have an enjoyable holiday season, we will see you in January. Christmas dinner fixin’s with maybe a few surprises. The cold nights have left us will limited greens but we will have a little more Spinach, it looks great. Beautiful tender and sweet Collards. Baby Chard for salads or sautéing. Some more Brussels Sprouts and a few heads of the crazy green Romanesco Broccoli. In Herbs we have Cilantro and Italian Parsley. Baby Leeks. It is root season with lots of sweet Japanese white Turnips and the storage Watermelon (sweet) and Black Spanish Radishes (spicy). A small supply of Red, Golden and the striped Chioggia Beets. Plenty of sweet orange Carrots and Purple ones too. In the starch/potato group- Jerusalem Artichokes (Sunchokes). ← Peregrine Farm News Vol. 10 #37, 11/22/13 Thanksgiving!